Bridget Bianco readies herself to make a save. 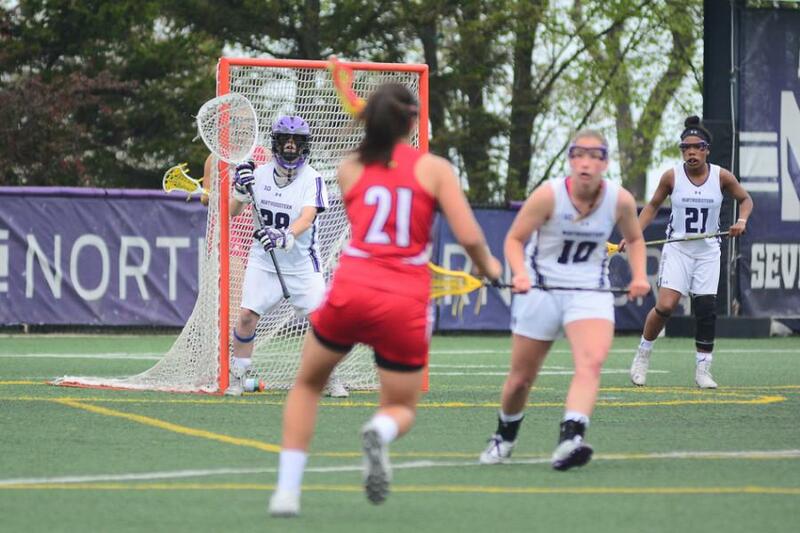 The senior goalkeeper wasn’t able to end her career on a high note, as Northwestern was blown out by Maryland in the quarterfinals of the NCAA Tournament. A matchup inundated in pregame hype failed to live up to its high-profile billing. No. 8 Northwestern and No. 1 Maryland, the two most successful programs in NCAA Tournament history, squared off Sunday in College Park, Maryland, in the tournament quarterfinal. The Terrapins (19-1) ran away with a 17-5 victory over the outmatched Wildcats (14-7). Maryland advances to its seventh consecutive championship weekend, while NU will miss the Final Four for the first time in 11 years. Part of the buildup to this game was the regular season contest between the two teams, in which the Cats suffered a 16-5 drubbing at the hands of the Terrapins. NU was unable to prevent history from repeating itself. The Cats kept the game close in the first half thanks to success in the draw control circle and slow, deliberate movement on offense. Maryland bested NU in the circle in the regular season matchup, but freshman Shelby Fredericks had the upper hand against reigning Tewaaraton Award winner Taylor Cummings in the NCAA Quarterfinal, helping the Cats win eight of 11 draws in the opening period. That translated into extended offensive possessions for NU, which wore down Maryland’s defense and limited the chances the Terrapins had on offense. Freshman Selena Lasota and sophomore Sheila Nesselbush netted 2 goals each in the first half, and the Cats faced a very manageable 6-4 deficit heading into halftime. But in the second period, NU lost any semblance of defensive posture and wilted under Maryland’s high-octane assault. The Terrapins went on a 9-0 run to start the second half, with the Cats unable to do anything to stop the bleeding. NU’s lone score of the frame came from junior Kaleigh Craig — more than 20 minutes into the second half with the Cats down by 11. The dismal second half performance by NU revealed its first half play as a mirage against the nation’s best team. The Cats had 13 draw controls to the Terrapins’ 11 and Maryland only outshot NU 24-19, numbers which don’t portend such a lopsided game. But the Cats committed a staggering 33 fouls, including 21 in the second half, while the disciplined Terrapins defense yielded only 12. Maryland took six free position shots, converting five into goals, while NU didn’t have a single attempt from the eight-meter fan. It’s an anomaly to not see the Cats featured in the NCAA Semifinals, but the future is bright for a perennially successful NU squad. The team loses just three key contributors to graduation: goalkeeper Bridget Bianco, defensive midfielder Jess Carroll and attacker Kara Mupo, and will return a core featuring six of the seven top goal scorers from this season, including a newfound draw control specialist in Fredericks.